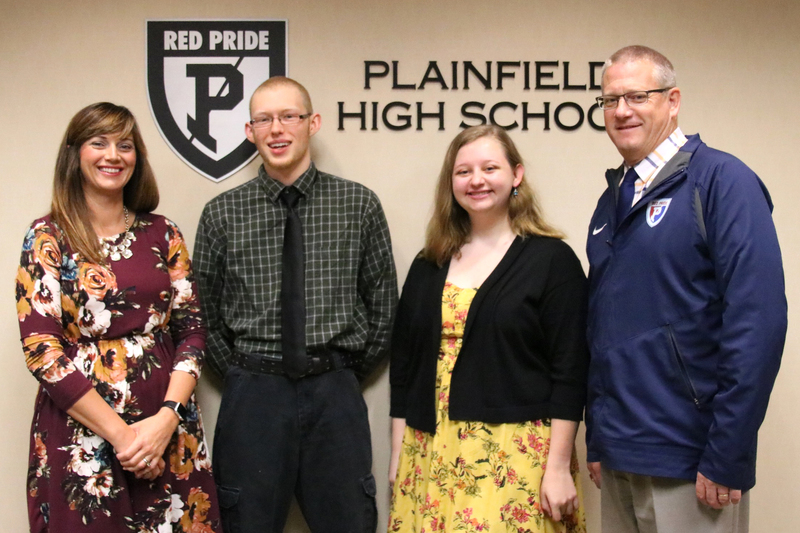 Two Plainfield High School students were honored today with the news that they’ve been recognized as semifinalists by the National Merit Scholarship Corporation (NMSC), and will continue the competition that results in approximately 7,500 National Merit Scholarships, estimated to total more than $32 million. Mary Czyzewski and Daniel Steely, PHS seniors, learned they are among the 16,000 Semifinalists in the 63rd annual program. This round began last spring when roughly 1.6 million high school juniors, representing 22,000 high schools, took the 2016 Preliminary SAT/National Merit Scholarship Qualifying Test. Czyzewski plans to attend Harvard or Georgetown to study International Relations, with the goal of serving as a diplomat one day. She is very active at PHS as a member of Belles et Beaux, We The People, Muslim Student Association and National Honor Society. In her spare time, she loves reading and jewelry making. Steely will study mechanical engineering at Purdue or Rose-Hulman Institute of Technology, with the ultimate goal of adding “inventor” to his title. While he’s been part of the band and robotics team, most recently he has spent time as part of his church’s building renovation team. Being able to use his knowledge of computer-assisted design programs, Steely was able to create drawings that saved his church significant cost. In addition to renovations, Steely has a great interest in electronics and building things. To become a Finalist, the Semifinalist and his or her high school must submit a detailed scholarship application, in which they provide information about the Semifinalist’s academic record, participation in school and community activities, demonstrated leadership abilities, employment, and honors and awards received. A Semifinalist must have an outstanding academic record throughout high school, be endorsed and recommended by a high school official, write an essay, and earn SAT® scores that confirm the student’s earlier performance on the qualifying test. From the approximately 16,000 Semifinalists, about 15,000 are expected to advance to the Finalist level, and in February they will be notified of this designation. All National Merit Scholarship winners will be selected from this group of Finalists. Merit Scholar designees are selected on the basis of their skills, accomplishments, and potential for success in rigorous college studies, without regard to gender, race, ethnic origin, or religious preference.